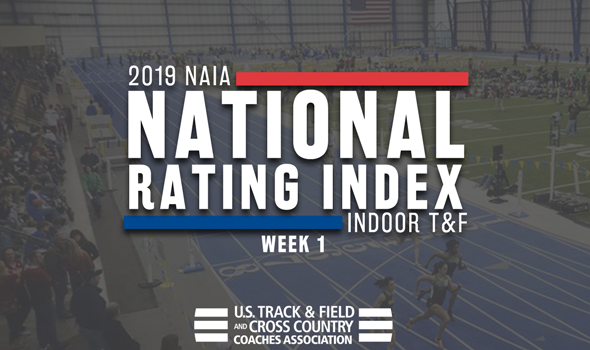 NEW ORLEANS – The first National Track & Field Rating Index (TFRI) for the 2019 NAIA Indoor Track & Field season was released on Wednesday by the U.S. Track & Field and Cross Country Coaches Association (USTFCCCA) and a familiar face headlines both the men’s and women’s chart. Indiana Tech’s men and women are the No. 1 teams in the nation based on efforts already turned in this season. The Warriors were the top-ranked teams in Week 1 last year, too, and both finished second at the NAIA Championships. The 2019 NAIA Indoor Track & Field Championships will be held between February 28 and March 2 in Brookings, South Dakota at the Sanford Jackrabbit Athletic Complex. Brookings is only the second city west of Missouri to host the NAIA Indoor Track & Field Championships in the 53-year history of the meet. It’s not even close in the Men’s TFRI as Indiana Tech owns a colossal advantage. The Warriors compiled 410.80 points in the first few weeks of the season, dwarfing second-ranked MidAmerica Nazarene (Kan.)’s total of 155.31. Indiana Tech did most of its damage this past weekend as two athletes shot to the top of the Descending Order List to join their teammates who were already there. Kejavon Moore clocked a nation-leading time of 6.70 in the 60 as well as the third-fastest time in the nation in the 200 at 21.41, while Brandon Smiley opened up with a 21.59 in the 200. That gives the Warriors a grand total of 10 top-3 marks so far this season. MidAmerica Nazarene (Kan.) received three top-3 marks this past weekend to help them to the No. 2 spot in the nation. The 4×400 relay is now ranked second with a time of 3:17.85, while Ben Downey registered the third-best time in the nation of 15:13.48 in the 3000-meter race walk and Isaac Zitterkopf comes in ranked third nationally in the long jump at 7.20m (23-7½). Third-ranked St. Francis (Ill.), fourth-ranked Grand View (Iowa) and fifth-ranked Doane (Neb.) round out the top-5 to begin the season. This is the best ranking in program history for both the Cardinals and the Vikings. Indiana Tech holds a commanding lead in the Women’s TFRI thanks to a number of top-ranked marks in the early part of the season. The Warriors were boosted by the performances of Doshawn Franks, Leondra Correia, the 4×400 relay and Destiny Copeland. Franks clocked the No. 1 time in the 600 at 1:25.65, while Correia is top-billed in the 60 hurdles at 8.65, the relay team got the baton around in 3:53.19 and Copeland posted a mark of 5.95m (19-6¼) in the long jump. Concordia (Neb.) and Doane (Neb.) are neck and neck for the No. 2 spot to begin the season. Both the Bulldogs and the Tigers have top-ranked athletes. Concordia (Neb.) is led by Adrianna Shaw in the weight throw (18.46m/60-3¾), while Doane (Neb.) has the top-ranked high jumper in the nation (Alexis Dale, 1.74m/5-8½). St. Francis (Ill.) and Hastings (Neb.) are ranked fourth and fifth to round out the top-5.